Here is step-by-step guide, how I got my driving license including all the relevant information at one place. Motor Cycle: Motor Cycle driving license is valid for motorcycle only. Motor Car: Motor car driving license is valid for car, jeep and Delivery van. LTV: Light transport vehicle driving license is valid for car, jeep, Mini bus and lightweight transport. HTV: heavy transport vehicle driving license is valid for buses, trucks, trailers and any type of heavy transport. Tickets, of mentioned value against each type of vehicle, are to be bought from GPO. Fill "Learner Permit Application Form"
Attach 2 passport size photographs, copy of CNIC and Medical Certificate. Paste Ticket of Rs.60 for each category. Deposit your complete application file to your nearest Traffic Police Office/ Licensing Center. They will immediately issue you Learner Permit, which will be valid for next 6 months. After 42 days of getting Learner Permit, you can apply for Regular Driving License. Fill "Regular Driving License Form-A". Attach 3 passport size photographs, copy of CNIC, Medical Certificate and Original Learner Permit. Paste relevant tickets on your application form. They will inform you about Time/Date for test. Appear in test on given date. Usually Verbal Test/ Interview and practical driving test are taken for Motorcycle, Rickshaw, Tractor and Car while a written test is required for LTV and HTV Licenses. Upon successful completion of these tests, you will be granted with a regular driving license. Application forms can be obtained from any photo state shop near to Licensing Center. You can apply only in your local driving test center, from the city of your domicile. However if you are temporarily residing in any other district (e.g. for employment etc.) you have to provide employment certificate/ resident certificate, issued from your department/ employer. Validity of driving license is 5 years. Before expiry, you have to renew your license from the same issuing authority/ office. Learn and remember all traffic signals before going for test. Usually they ask you to drive in "L shape" forward and backward for Motor Car and LTV. However they may ask you for driving in "? Shape" forward/ backward and parallel parking for HTV. Sir plz sent licence motor bike my home address 9 usman block new garden town Lahore. ALAS in quetta traffic police is really illiterate and ignorant, and we don't have such set up where we could have whine. If we drive passenger vehicle then license category should be must "PSV"
Hy, can i apply for regular licence without getting learner permit. I am in abroad and I am belong from sargodha panjab. I have valid motor car moter cycle and htv . But I want psv how I can apply in abroad or in Pk. DEAR SIR MY NAME IS IMRAN ASGHAR AND I LOST MY LTV LICENCE ABOUT THREE YEARS BACK AND DID NOT LODGE AN FIR BCOZ I THAUGHT IT BE LYING IN MY LUGGAGE AT LAHORE SO DAYS PASSED AND I WENT TO KARACHI FOR MY JOB . No you must have a valid CNIC. And minimum 18 years of age is necessary for it. No, you have to apply separately. Hi Sir I have motor car licence I want to get HTV licence now I am in Dubai how can I get HTV licence. ..
Dear, If you want to get HTV license, you will have to reapply and retake driving test for which you have to be in Pakistan. ASSALAM U ALIEKUM everyone. My age is 17 and half and my date of birth is 30/01/2002 and I would like to be a CAREEM CAPTAIN and drive motorcycle on CAREEM. Driving license is required for it. Am I applicable to make it right now I've CNIC as well but juvenile (smart card) issued from NADRA OFFICE for my O Levels Exams. 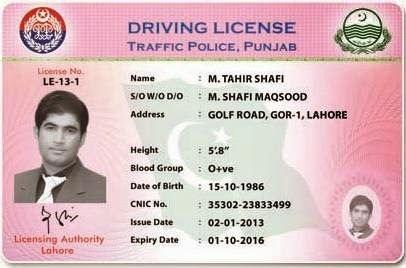 So is driving license applicable on smart CNIC? ?